Today was a hectic, stressful but fun day. It has been a while that I was under pressure and exercised crisis management after not doing so for months and months. It is a good thing, I reckon – to feel the stress of what you do. That shows that you care about the thing you do and demand perfection. I finally got around to take individual photos of each flavour of the cupcake since I made cupcakes sampler packs today. I hope it speaks more than the descriptions that you can read on the Menu page. So if you are a visual person, today is your day! 🙂 Previously, the order I have received opted the double chocolate flavour or plain vanilla flavour which is why there are no significantly different pictures in this blog. Since I like things simple, there will be no crazy coloured frostings or funky names to these cuppies. It’s hard for me to remember non-indicative names and I think the simple naming will be better off for all of us (besides, me and remembering names don’t really go together, even on people.) Although, for aesthetics’s sake I tweaked slightly a couple of the cuppies presentation just so that it is a little different and to spice things up a bit. Tiny blue flower with edible dragee for Double Chocolate cuppies and peanut butter chocolate ball for Chocolate Peanut Butter cuppies (don’t you just absolutely love the combination of these two?) 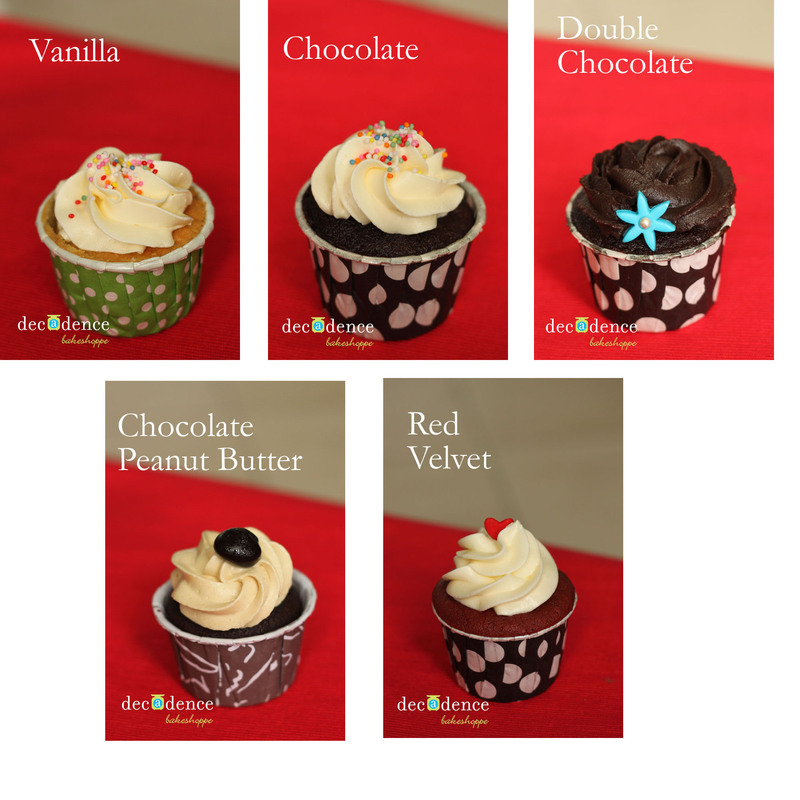 I have done 5 photos out of the 7 flavours we offer on the menu. So here they are!